However, his promise to the court to be a good citizen from here on out came too late to keep him out of prison. His pleas to be allowed serve a non-custodial sentence for his most recent crimes were dismissed by the three judges. His offences were premeditated and far too serious. The events, which led to one of the country’s most notorious terrorists being sent back to prison after 13 years of freedom, took place on 9 June 2015 in the west of Dublin. Martin Byrne worked in security and other areas for the late Jim Mansfield who owned the Citywest Hotel and other businesses. Mr Byrne worked for Mansfield for 20 years and lived in two of Mansfield’s units which were joined together, numbers 5 and 6 The Towers, near the Citywest complex. He had a long-term agreement with his employer, but when Mr Mansfield Senior died, the situation changed for Mr Byrne. Jim Mansfield Junior took over his father’s business interests and the Special Criminal Court was told that the home Mr Byrne lived in with his family became the subject of a dispute between the new owner and others. Mr Mansfield junior asked Mr Byrne to go with him to a meeting with "businessmen" at Keatings Business Park in Saggart in May 2015 to see if they could "reacquire his interest in The Towers". Martin Byrne felt uncomfortable but agreed to go along. He became even more uncomfortable when he walked in the door and saw who the "businessmen" were two former INLA men - the violent kidnapper Dessie O'Hare and the convicted murderer Declan 'Whacker' Duffy. Mr Byrne knew immediately who they were and told the group he couldn’t participate in the conversation. He also said that he didn’t think Mr Mansfield jnr should either and he left. Relations between Martin Byrne and his employer deteriorated. There was, he said, little contact between them until Mr Mansfield jnr phoned him on 8 June 2015 and asked him to go with him to another meeting at the same business park the following day. Mr Byrne was very reluctant to go but he did. While they were driving there he said Mr Mansfield put a call on the car phone speaker to a person who confirmed to both of them that everything was in order. But things didn’t look that way to Martin Byrne when he arrived in Keatings Business Park. He noticed several cars parked there and he had a feeling that something "out of the ordinary" was happening. He and James Mansfield jnr walked into one of the units and knew there could be trouble when he saw Dessie O'Hare first, then Declan Duffy. Trouble was confirmed when 'Whacker' Duffy told him he "wouldn’t be as brave now". Mr Mansfield turned around and walked out the door but when Mr Byrne tried to leave, his way was blocked by five more men coming in. O'Hare told Mr Byrne that he and his family were going to be evicted. Mr Byrne pleaded with O'Hare to be given a few days to leave The Towers voluntarily, but O'Hare wasn’t interested. "It’s going to happen right now. You’re getting out." Mr Byrne was beaten, bundled into a car, beaten again in the car and driven back to The Towers. O'Hare followed in a second car. The security guard who worked at the complex, John Roche, had the misfortune to be on the gate that day and when he saw who was in the car demanding to be let in, he refused and ran away. Mr Byrne however, told the gang that the mechanism was broken and that if they drove up to the gate it would open, which they did. The "mob" recruited as "muscle" to evict the Byrnes included 39-year-old Christopher Maguire, from Dun Emer place in Lusk, Co Dublin, 29-year-old Daniel Kane from Hollycourt in Ballybrack, Co Dublin and 26-year-old Donal O'Hara, a violent burglar from Glin Park in Coolock, Dublin. Once inside the complex the first person they pulled out of his home at Number 7 the Towers, right next door to Martin Byrne’s home, was John Roche. The gang proceeded to beat up the security guard. CCTV footage of the attack shows Mr Roche being punched, kicked, stamped on and beaten to the ground. Dessie O'Hare can be seen directing operations and kicking John Roche four times. The footage also shows Martin Byrne's wife Lisa and their son being led away by other members of the gang. Lisa Byrne was in her own words "hysterical". The men forced their way into her home. She was ordered to go upstairs and get dressed while her son remained downstairs. One of the men followed her and stood in the bedroom watching her as she put on her clothes. The mother and child were then led away past the scene of the attack as the beating continued. Ms Byrne was told what was happening to John Roche would also happen to her husband Martin. The attack in broad daylight did not go unnoticed and several other residents called the gardaí. At 12.10pm the first local garda unit arrived. Martin Byrne was ordered out by the gang to tell them that everything was okay. The first garda on the scene knew Mr Byrne and could clearly see from his appearance that everything was far from okay. As more garda units arrived, including armed officers, the gang fled. Some were arrested nearby but Dessie O'Hare managed to escape across the border to Northern Ireland. The State commenced extradition proceedings to bring him back to Dublin to face trial. O'Hare initially contested the case but ultimately decided to come back of his own volition. One evening he walked into Clondalkin Garda Station with a pre-prepared statement and was arrested and questioned. O'Hare denied he had been involved in criminal activity and told the gardaí that he had been employed by James Mansfield Junior. He was sent for trial to the Special Criminal Court where the allegation was repeated in evidence by the Senior Investigating Officer Colm O'Malley. O'Hare considered fighting the case in court but instead pleaded guilty last December to assault and false imprisonment. He was jailed for seven years. Mr Justice Tony Hunt specifically identified Dessie O'Hare’s reputation as a significant factor in the case. The 62-year-old is no ordinary criminal or terrorist. Born in South Armagh to a family with republican beliefs he joined the IRA at 16 years of age. O'Hare became involved in a series of shootouts along the border with both the gardaí and RUC, crossing back and forth and later became known as the 'The Border Fox'. He has several convictions North and South for possession of explosives and firearms as well as one for assaulting a garda. O'Hare left the IRA in the late 1970s and joined the INLA and was shot several times in 1979. He and two others hijacked a car near Keady RUC station and one of them, Peadar McIlvenna, was shot dead in the ensuing shoot out. Gardaí arrested him later that year when he crashed his car into a herd of cattle in a field in Co Monaghan. Another of his accomplices Anthony McClelland was killed in that incident. The following year O'Hare was convicted of possession of firearms and sentenced to nine years in prison. He also got married in prison to a local woman, Clare Doyle, from Keady, Co Armagh, and they had a daughter a few months later. Following his release in 1986, he became involved in the murderous internal INLA feud which led to 12 deaths including that of the former leader Dominic 'Mad Dog' McGlinchey. O'Hare was opposed to a peace deal with the rival IPLO faction. A cruel, ruthless and extremely violent terrorist, he earned the nickname "blood and guts" among his colleagues. The following year he split from the INLA, formed a new group calling themselves the "Irish Republican Brigade" and claiming to be committed to an armed revolutionary struggle. He issued a handwritten press release and signed it "little bird" believed to be a reference to a poem by Padraig Pearse. Whatever his motivation, ideological or criminal, O'Hare and his gang needed money. Kidnapping had long been seen by criminals and subversives as a potentially lucrative source with Dr Tiede Herrema, Don Tidey, Ben Dunne and Jennifer Guinness all victims of the crime in the 1970s and 1980s. On 13 October 1987 Dessie O'Hare got involved in it when he led a gang that smashed their way into the Cabinteely home of the Dublin dentist John O'Grady. The gang, which included Eddie Hogan from Cork, Fergal Toal from South Armagh and Tony McNeill from Belfast had intended to kidnap Dr Austin Darragh, the owner of the Institute of Clinical Pharmacology. However, he had moved out of that house almost four years earlier. His son-in-law was living there with his family, so two of the gang held them at gunpoint while the other two kidnapped John O'Grady instead. They left three code words to be used on contact. John O'Grady was first kept in a basement in Dublin before being moved to a cargo container in Cork. O'Hare demanded a ransom of £1.5m (over €5m today). The dentist was held for 23 days but when the money was not forthcoming O'Hare hacked off John O'Grady’s two little fingers with a chisel. He was then handed a hot knife to cauterize the wound. "I just sent word to my men to chop off two of his fingers so I don’t know what fingers they are going to chop off." "I’ll ring you later and tell you where to pick these fingers up, and the photographs and the note. It’s just cost John two of his fingers. Now I’m going to chop him up in bits and pieces and send fresh lumps of him every f**king day if I don’t get my money fast." Fr Brian D'Arcy agreed to act as an intermediary as Dr Darragh frantically tried to raise the necessary cash to pay the ransom. However on 5 November 1987, the gang was traced to a house in Cabra in Dublin. John O'Grady was rescued after a shoot out during which a garda detective was seriously injured. O'Hare had already left the scene and was by now one of Ireland’s most wanted criminals, sought for questioning in connection with at least 27 killings and a string of robberies on both sides of the border. O'Hare was on the run for three weeks before he was stopped at an army checkpoint in Urlingford, Co Kilkenny. Another shoot-out ensued and a soldier was wounded. Martin Bryan who was with O'Hare was shot dead - the third of his accomplices to be killed in his company. O'Hare had vowed he would not be taken alive and while he was injured, once again he survived. Dessie O'Hare was brought before the Special Criminal Court in Green Street where in April 1988 he pleaded guilty to false imprisonment, wounding with intent and possession of firearms. He was sentenced to 40 years in prison. The veteran journalist Diarmaid McDermott was in court that day 31 years ago as he was again last Thursday. He recalled O'Hare’s "rambling rant" from the same dock where Robert Emmet made his famous speech in 1803. The speech did not have the desired effect. O'Hare’s former paramilitary colleagues in both the IRA and the INLA disowned him. The 'Border Fox' had become a liability. At one stage he embarked on a self-imposed vow of silence in Portlaoise prison and didn’t speak for six years. After serving less than half of his sentence Dessie O'Hare was freed under the terms of the Good Friday Agreement. He first got out of jail in 2006 before his licence was finalised in 2008. He had associated with major Dublin criminals in the 1980s, including The General and moved around various safe houses in Coolock, Artane, Rathgar and Rathmines. Twenty years later he renewed his acquaintance with gangland criminals. O'Hare claimed to be working full time in farming and tarmac surfacing. However, he was also seen to be mixing with senior figures in organised crime. He was attacked and beaten up by gangsters in Dublin, although he told gardaí he sustained his injuries, including a bloody nose, in a traffic accident. One of his closest friends was the veteran drug dealer Eamon Kelly who was shot dead in December 2012. O'Hare carried his coffin at the funeral. In returning him to prison last Thursday Mr Justice Tony Hunt described him as an "enthusiastic participant" who had admitted he had been employed to carry out his most recent crimes. 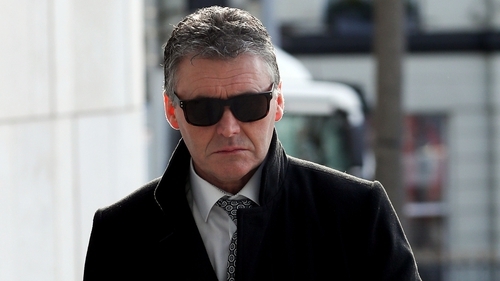 The reputations of O'Hare and fellow mob member Declan Duffy, the judge said, would have been well known to the victim and part of the plan to intimidate and evict him. The judge said O'Hare’s previous criminal record was relevant and when Mr Byrne did not "take the hint at the first meeting", the attack took place at the second one. Dessie O'Hare said his crimes were a once off and by no means reflective of the character he had shown over his last 13 years of freedom. He also said he was sorry for what he had done and wrote a letter of apology. He said he feels he has let down family and friends, that he wants to change from his previous life and that he has shown himself to be "capable of functioning and contributing to society". Prison, he argued, had been "a very difficult experience" for him with "enduring, serious, intrusive and long term consequences". It would, he felt, be "a particularly onerous and harsh punishment" to send him back there and one that for him would be "difficult to bear". However the three judges of the Special Criminal Court did not agree. They found O'Hare was an organiser and high-level participant in the crimes and even though he had applied himself positively in the last 13 years, they did not accept his offending was "isolated". What Dessie O'Hare had done this time was far too serious and premeditated to be overlooked and they found his predisposition to violence had not abated in the time since he had been released under the Good Friday Agreement. O'Hare's victims must also be remembered. Martin Byrne is now "out of pocket" and "unemployed". The "mental impact" of this "life changing event" he said, "far outweighs the physical impact". His children have "lost their childhood" and he has to "live a clandestine life since the day of the assault and false imprisonment". The court agreed that the damage to the Byrne family was significant, ongoing and permanent. They remain in witness protection. The other former INLA man Declan 'Whacker' Duffy was jailed last year for six years for his role in the attack but things have since got worse for him. He had been serving a life sentence for the murder of a British Army sergeant in Derby city in 1992 but like O'Hare he too had been freed under licence under the terms of the Good Friday Agreement. However on 6 June 2016, the Under Secretary of State for Northern Ireland revoked Duffy’s licence and recalled him to prison. A European Arrest Warrant was issued for him and endorsed by the courts here in 2017. Last year the High Court ordered his extradition to continue his life sentence but postponed it until he completes his sentence here in 2022. As he sits in his cell in solitary confinement on the A wing in Portlaoise prison tonight, Dessie O'Hare can take comfort from the fact that the Irish Government will not be following Northern Ireland’s lead. The Department of Justice has said it will not be reactivating his 40-year prison sentence for kidnapping and mutilating John O'Grady, less than half of which he spent behind bars. The Department says the law provides that sentenced persons are entitled to one quarter remission and a sentence is deemed to have been served when three quarters of the term has been completed. And this, it says, applies whether or not a sentenced person is in custody. That means that Dessie O'Hare's 40-year sentence with ten years' remission expired last year after 30 years. Declan 'Whacker' Duffy can only look forward to more time in prison after his sentence for committing the same offences as Dessie O'Hare. However the Department of Justice here says that a life sentence is "quite different" because a person, like Declan Duffy, who was on early release from a life sentence can still be recalled to prison in certain circumstances. So while Dessie O'Hare does not have to serve another 30 years, he’s not quite out of the woods yet. The Special Criminal Court jailed him for seven years which means he’ll be out in July 2024. However the way the sentence was constructed, ten years with three suspended, means that if he steps out of line again he’ll have to go back to prison to serve another three years. And that suspension was for the rest of his life. Dessie O'Hare will be allowed walk the streets again when he’s 67 years of age. The threat of further imprisonment will however, always hang over him.